of suspected communists and communist sympathizers. 210 were illegally massacred in two mass killings at the base of Seotal Oreum. and it cut the city in two. and reflected on the blessings of walls coming down. The morning began at 4:15 in the blessed AM when I awoke to attend the saebyuk kido service at the Central Dream Dome (Jeonju Jungang Presbyterian Church). I had the privilege of bringing greetings to the congregation. They prayed for me. After worship, JC Lee and I went to the Gimpo International Airport. From there we flew to Jeju Island. Two pastors met us and we had a wonderful pork barbecue lunch. I spoke at the oldest Presbyterian congregation on the island. Four of us then went to the Jeju April 3 Peace Park. There I learned about the Jeju April 3 incident. There is more to learn. Dinner followed. I met the publisher of the Jeju Weekly and her charming daughter. Then off to the Guest House of Jeju National University. The day began on Jeju Island. There I learned more of the island’s pain. After breakfast, the Rev. Dr. JC Lee and the Rev. Youn-Hong Kang took me to see more of the island’s history. We began at the Jeju Museum of War, History and Peace. The museum provides education about the Japanese occupation of Jeju Island. 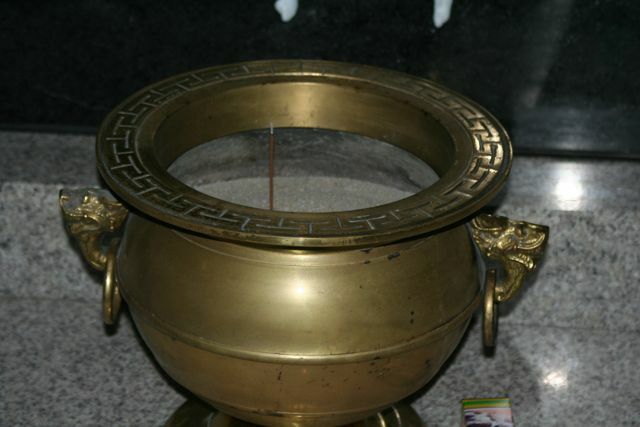 It is located at the site of the Gama Oreum Underground Fortress. Here the Japanese used forced labor of the people of Jeju to construct an elaborate underground fortress to use as a defensive position to protect Japan from invasion by the United States. Japan had previously used Jeju as a staging ground for offensive maneuvers. In 1950, after the Korean war broke out, the Korean government issued orders of “preventative detention” of suspected communists and communist sympathizers. Of the 344 people the Moseulpo Police detained, 210 were illegally massacred in two mass killings at the base of Seotal Oreum. At the site of the killings, Seotal Oreum makes a semi-circle around a small field. Apparently those who did the killings stood on the ridge with the victims gathered in the field. 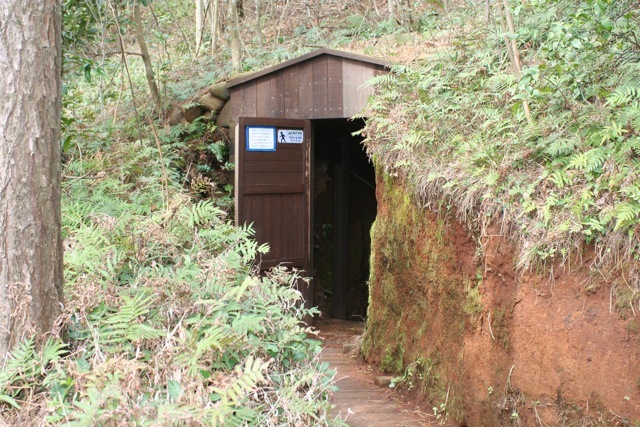 A number of bunkers that once housed Japanese war planes can be seen from the Massacre Site. Our final stop brought us to an encampment of protestors against the naval base being built at Gangjeong village. The base is being built for the navy of the Republic of Korea. However, some have expressed the view that the base can accommodate U.S. nuclear-powered submarines and aircraft carriers. 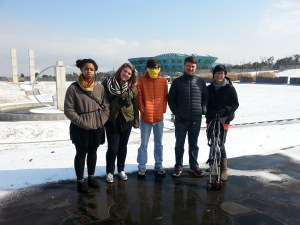 Environmentalists raise concerns for the coastline surrounding Gangjeong Village. Natural fresh-water springs bubble up through the surface. Local villagers consider the site and the water sacred. In addition to the environmental issues, questions exist concerning the process by which the local villagers were consulted. Should the base be completed, many of the local residents will have to relocate. It is unclear where the funds for that relocation will come from. But beyond all that, in 2005 then South Korea’s President Roh Moo-hyun, apologized for the Jeju April 3 incident in which between 20,000 and 30,000 islanders were killed. 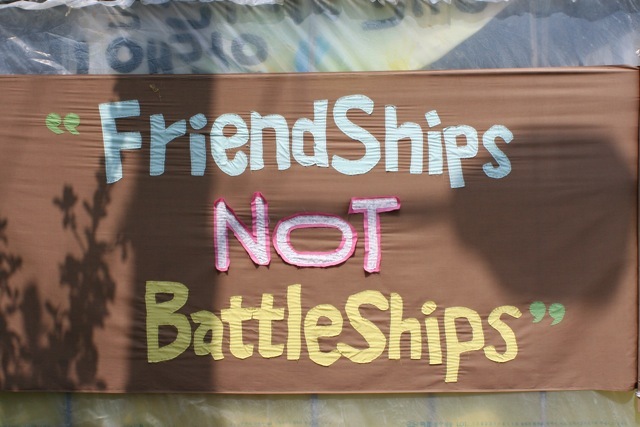 He designated Jeju as an “Island of World Peace.” Why does an Island of World Peace need a naval base? I had much to ponder on the drive to the airport and the flight to Gimpo International Airport. I have much to ponder still as I sit in a hotel room in Suwon. Rarely does such a request throw me. Standing in the Memorial Tablet Shrine at the Jeju April 3 Peace Park, however, words failed to come easily. Earlier in the day, JC Lee and I had flown to Jeju Island. Two pastors met us and we ate a wonderful pork barbecue. We went to a Presbyterian Church where I made my presentation on the role of the Church in the public arena. 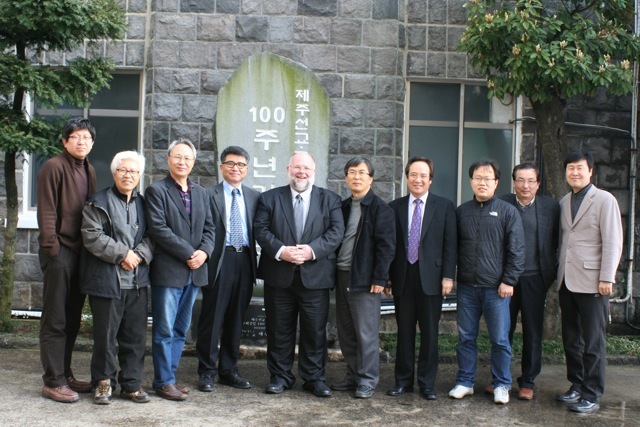 After photos and goodbyes, four of us, pastors all, loaded into a car to go to the Jeju April 3 Peace Park. Several of my hosts had asked me if I knew the history of Jeju. I confessed that I had done enough research in advance to know that the island had, as do many places in the world, a troubled past. I was about to learn how troubled. A short drive brought us to the park. We toured the Jeju April 3 Peace Memorial Hall. Aided by an English-recorded audio device, I learned much. Mostly what I learned is how much I need to learn. The Jeju April 3rd incident broke out during the US Military Administration [of the Republic of Korea] and lasted for seven years. After the independence from Japan in 1945, Korea was in turmoil due to the failure of the policies of the US Military Administration and other social conflicts. Under these circumstances, it happened that the 6 residents were killed on March 1, 1947 by the police. The US Military Administration dispatched the troops of the police and youth corps called “Seochung” to Jeju Province to suppress the Jeju civilians and government workers/ general strike. The dispatched soldiers terrorized and tortured Jeju civilians. Consequently, on April 3, 1948, the armed members of the Jeju branch of the Namro Party raised disturbances to protest the troops’ brutalities. Additionally, in the May 10 general election that established the division of the Korean peninsula, two of the three electoral districts on Jeju had invalid results due to people refusing to participate in the election. It was on August 15, 1948, after the establishment of the Republic of Korea, that the Central Government dispatched more troops to quell the disturbance by powerful suppressing action. On November 17, martial law was proclaimed. Many local people were executed for giving assistance to the armed guerrilla band. When the Korean War broke out in 1950, some people arrested by the police and the prisoners in the mainland were executed. The Jeju April 3 Incident, caused by the shooting incident on March 1, 1947 and the uprising o April 3, 1948 lasted for 7 years until the prohibition of entering Mt. Halla was lifted. 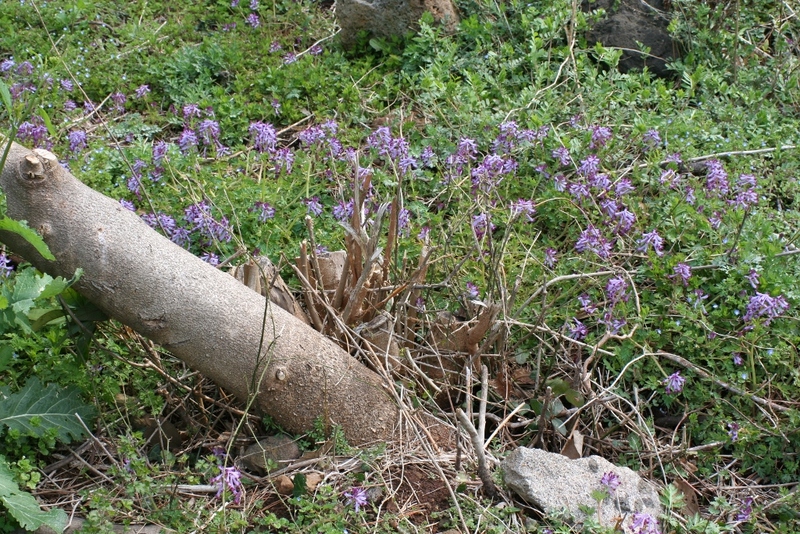 The Jeju April 3 Incident resulted in the loss of 25,000~30,000. The Jeju April 3 Incident, which broke out in the mood of the world Cold War and the division of the Korean Peninsula, produced mass victims caused by the Central Government power. Currently, the truth of the Jeju April 3 Incident is being unveiled in the pursuit of reconciliation and mutual prosperity. 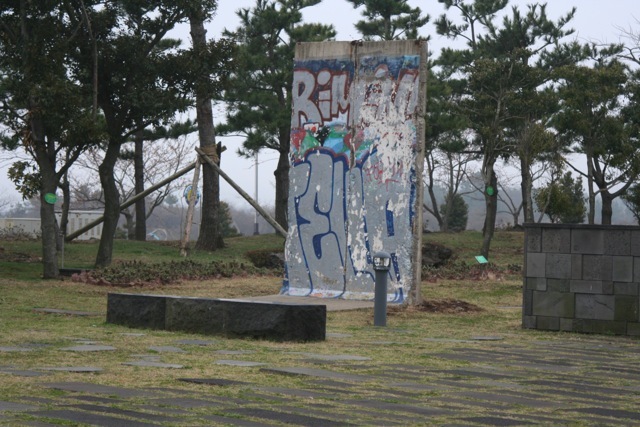 The images in the Jeju April 3 Peace Memorial Hall are haunting. The complex tale is harrowing and heartbreaking. Imprisonment. Torture. Execution. Displacement. Scorched earth. Labels of being “Reds”. Villages destroyed. The United States role through the US Military Administration. So many dimensions. For years, the story went untold; discussion forbidden; investigation suppressed. That has changed. Activists, scholars, and the government have begun to explore the Jeju April 3 Incident, but much remains to learn. Following our visit to the Jeju April 3 Peace Memorial Hall, we went to the Memorial Tablet Shrine. Simple black tablets bear the names of persons killed during the Jeju April 3 Incident: more than 14,000 tablets, sorted by village. We pray for those who died on Jeju Island; we give thanks for their lives; we pray for comfort for those who mourn their deaths. We pray for peace. 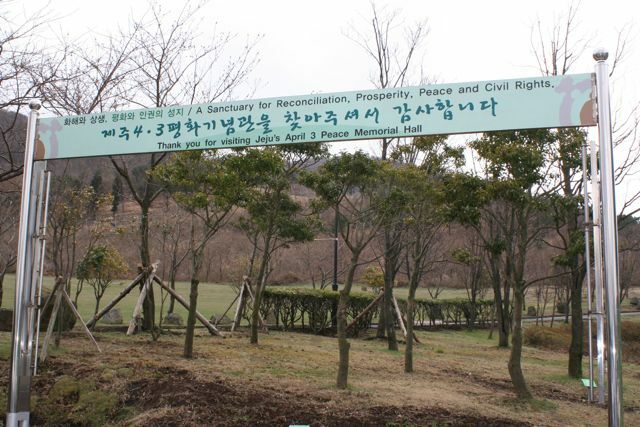 Peace for the people who live on Jeju Island. Peace for all the people of the Korean Peninsula. Peace for all the peoples of your world. We pray that the day may soon come when we live together as brothers and sisters as you intend. In Jesus’ name. Amen. My new friends responded: “Amen.” And we entered the sacred place. I have much to process, much to learn.